Our updated Satechi R1 stand quickly elevates any mobile device or tablet for an optimal viewing experience. Constructed from solid aluminum, the R1's supporting grips are finished in rubber to hold your tablet without scratching or slipping. It's compatible with most cases, too. The R1 will hold your tablet at the right height and angle- perfect for working with a Bluetooth keyboard, watching movies or video conferencing on Facetime. With a variety of elegant colors, the Satechi R1 stand is the perfect match for any office, home, store, or work space. Featuring a solid aluminum construction to securely hold your laptop or tablet. With its smooth and elegant design, the R1 stand is the perfect addition to your workspace or desktop. Available in four modern colors: Silver, Gold, Space Gray and Rose Gold. With the R1 stand, easily check your inbox, video conference on FaceTime and watch movies, all at the perfect angle. Its 270-degree mount and base hinge effortlessly adjusts your device to the perfect height/angle and minimizes any neck strain. Don't just leave it on your desk, the R1 stand easily folds and collapses to fit in your briefcase or backpack. With its compact and portable design, you can take it on-the-go, wherever you go. Securely holds 4" to 13" tablets and smartphones. Works with your iPad, iPad Pro, iPhone X, 8 Plus, 8, MacBook 2015/2016, Nintendo Switch, Samsung Galaxy S8, Google Nexus, HTC, LG, Kindle, Amazon Fire, Microsoft Surface Pro 4, Dell Venue 10, Sony Xperia Z4, Samsung Galaxy Tab S2 and more. UNIVERSAL COMPATIBILITY - securely holds your 4" to 13" tablets and smartphones, including your iPad, iPad Pro, iPhone X, 8 Plus, 8, MacBook 2015/2016 Nintendo Switch, Samsung Galaxy S8, Google Nexus, HTC, LG, Kindle, Amazon Fire, Microsoft Surface Pro 4, Dell Venue 10, Sony Xperia Z4, Samsung Galaxy Tab S2 and more. SLEEK & STABLE DESIGN - never worry again about your tablet tipping over! Hands-free display holds your tablet with a solid aluminum construction and rubber pads grip to prevent any scratches or sliding. 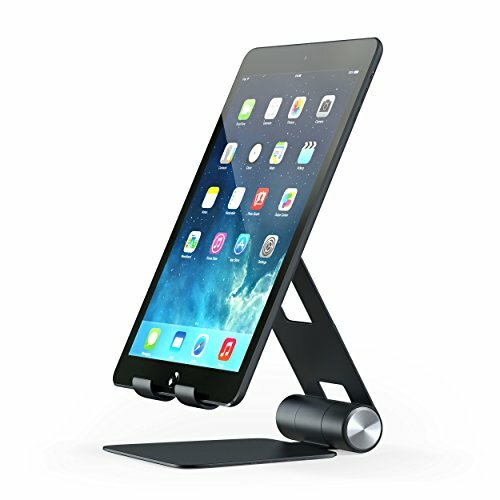 ADJUSTS TO THE PERFECT ANGLE - whether you are watching YouTube videos, using FaceTime or just checking your emails, the R1 stand effortlessly maneuvers between Portrait, Landscape or Flat orientation with a 270-degree mount and base hinge. FOLDS & COLLAPSES - portable design to easily fit in your briefcase or backpack. With its compact size, take the R1 stand with you on-the-go or simply store away when not in use. FOUR SLEEK, MODERN COLORS - choose between Silver, Gold, Space Gray and Rose Gold to perfectly complement your home, office, store and work space. If you have any questions about this product by Satechi, contact us by completing and submitting the form below. If you are looking for a specif part number, please include it with your message.